Director – Greg McLean, Screenplay – James Gunn, Producers – James Gunn & Peter Safran, Photography – Luis Sansans, Music – Tyler Bates, Visual Effects Supervisor – Andre Bustanoby, Special Effects Supervisor – Daniel Cordero, Makeup Effects – MastersFX (Supervisors – Chris Clark & Sarah Pickersgill), Production Design – Carlos Osorio. Production Company – Troll Court Entertainment/Safran Company. It is a workday as any other for the employees of the offices of the multinational corporation Belko Industries in Bogota, Colombia. The locals are sent home early but when the English-speaking staff go to leave for the day, steel shutters come down blocking all exits from the building. A voice over the P.A. informs the eighty employees now trapped inside that they have two minutes to kill two of their number or four people will be killed at random. Thinking this a practical joke, they ignore it, only for the heads of four employees to explode. They realise that the tracking devices that were planted in their bodies to prevent kidnapping are actually remote-activated explosives. The group are then told that unless they kill thirty of their number within the next two hours, sixty of them will be killed. This begins heated argument among the group about what to do. CEO Barry Norris leads a group as they break in to a vault containing handguns and then begin shooting people. This sparks off a desperate and bloody fight for survival. The Belko Experiment started as a project from James Gunn, best known for the Guardians of the Galaxy films. (See below for James Gunn’s other films). Gunn wrote and was set to direct the film in 2010. However, he was going through a divorce from actress Jenna Fischer and decided against the project on the grounds that he didn’t want to spend the time living in such a dark and violent headspace. In 2015, the script was resurrected by Greg McLean, the Australian director best known for Wolf Creek (2005) and Rogue (2007). (See below for Greg McLean’s other films). Gunn remained centrally involved as writer and producer with the finished film even retaining some of his original casting choices, including his brother Sean who has an amusing role in the film as a stoner with a case of the paranoias. The probable starting point for The Belko Experiment was Saw (2004), which features the serial killer Jigsaw devising a series of fiendish death traps designed to drive people to moral extremes. There were a great many horror films that came out riffing on the basic premise of the Saw films and putting a group of people through torturous traps. Even beyond that, the last few years have seen a number of films featuring brutal elimination games, most notably with the popularity of The Hunger Games (2012) and The Purge (2013) films. I kept being reminded of Stuart Hazeldine’s Exam (2009) in which a group of applicants for a job are locked in a room and asked to work out what the question is whereupon the situation mounts to an increasing desperation and outright violence amongst the contenders. When it came to the end revelation about the experiments, I also kept thinking back to the premise of death traps as a psychological test we had in The Maze Runner (2014). 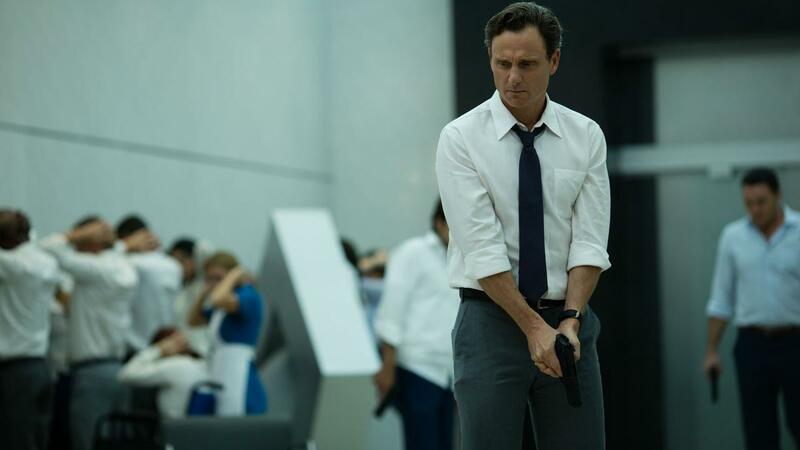 Before you sit down to watch, the very concept of The Belko Experiment is black satire. On the other hand, very little of this dark humour translates onto the screen. The way that Gunn and Mclean approach it comes out more as something akin to Battle Royale (2000). McLean relishes the opportunity to have the screen drenched in blood as the employees take to butchering one another with their bare hands. That said, there are surprisingly few of the novelty deaths we get in Battle Royale – I would have thought there would have been enormous potential in a film like this to show how people manage to turn ordinary office equipment into improvised weapons but, beyond a couple of novelty uses of a stapler and a guillotine blade, this is something the film lets slip by. The script even handily supplies the employees with a small arms locker and thereafter has them simply shooting each other to death. It is a case of the amusement of the idea being far stronger than the delivery. James Gunn’s script never does too much with the basic premise beyond setting it up – the climactic twist is one that is maddening in its lack of any real answers. The characters seem merely statistics – we are given a cursory romantic plot that feels unnecessary – but there is little that has you rooting for particular characters to survive. You are drawn by the film’s premise but there feels little else – either in terms of engaging characters or plotting twists – that keeps it going after that point other than watching the hit count of deaths escalate with bloody abandon. James Gunn started working at Troma Films, co-writing Tromeo & Juliet (1996) and Troma founder Lloyd Kaufman’s biography All I Need to Know About Filmmaking I Learned from the Toxic Avenger (1998), which became the basis of Terror Firmer (1999). Gunn graduated to a screenwriter of A-list films such as Scooby-Doo (2002), Dawn of the Dead (2004) and Scooby Doo 2: Monsters Unleashed (2004). Gunn made his directorial debut with the alien monster movie homage Slither (2006), the superhero with no powers comedy Super (2010), the Beezel segment of Movie 43 (2013) and the Marvel Comics adaptation Guardians of the Galaxy (2014) and its sequel Guardians of the Galaxy: Vol. 2 (2017). Greg McLean first appeared with the harrowing Australian Backwoods Brutality film Wolf Creek (2005). McLean subsequently went onto make the incredible killer crocodile film Rogue (2007), Wolf Creek 2 (2013), the ghost story The Darkness (2016) and the non-genre survival film Jungle (2017). In addition, McLean has also produced Crawlspace (2012) and the tv series spinoff of Wolf Creek (2016– ).